Thursday November 24th 1892 I was sewing a little on a dress I got for myself yesterday in the morning and after dinner took more dishes and went to Marys. I came back about four oclock to do some work and took Mother over about four oclock. I helped Josie get the supper ready and Will and I dressed and walked over about six oclock. Father had gone before. The wedding party was a pleasnt one. The bride looked well. the supper was splendid and the presents very nice. It was ten colock when we got home. Friday November 25th 1892 It rained and snowed all day making the walking very bad. I staid in doors all day sewing on my dress. I read in the evening. Will has only one man at work now. Saturday November 26th 1892 I was busy about the work most of the forenoon as it was late when we got up. I finished my dress in the afternoon and read all the evening. weather brighter. Sunday November 27th 1892 It was very late when we got up. I was busy with the house work till after dinner. I read all afternoon and evening. weather cloudy and misting again freezing as it falls. 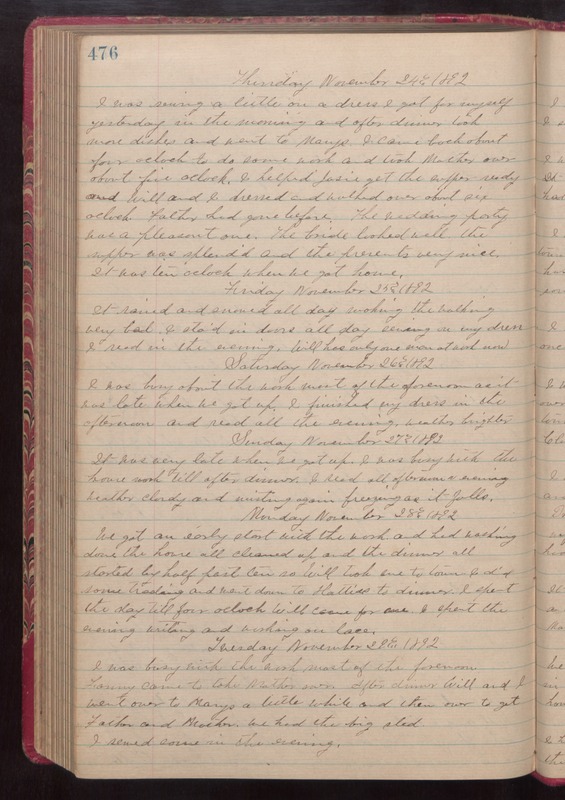 Monday November 28th 1892 We got an early start with the work and had washing done the house all cleaned up and the dinner all started by half past ten so Will took me to town. I did some trading and went down to Hatties to dinner. I spent the day till four oclock. Will came for me. I spent the evening writing and working on lace. Tuesday November 29th 1892 I was busy with the work most of the forenoon. Fanny came to take Mother over. After dinner Will and I went over to Marys a little while and then over to get Father and Mother. we had the big sled. I sewed some in the evening.